DLF presents an intelligent destination for the IT/ITES world, Bldg. 6. A LEED Gold Certified building, it is an integrated technology Park offering modern workspaces to the IT and ITES companies. It is strategically located just off the NH-8 and in close proximity to the airport and is directly linked through the expressway to Delhi. 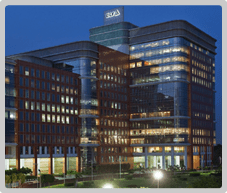 DLF Cybercity Gurugram is a benchmark business destination offering world class work spaces, exceptional infrastructure and facilities comprising a plethora of futuristic amenities. The Bldg. 6 campus constitutes of 3 blocks comprising of 0.86 mn sq. ft. that is fully occupied and operational.